Look at me posting for a second time today! 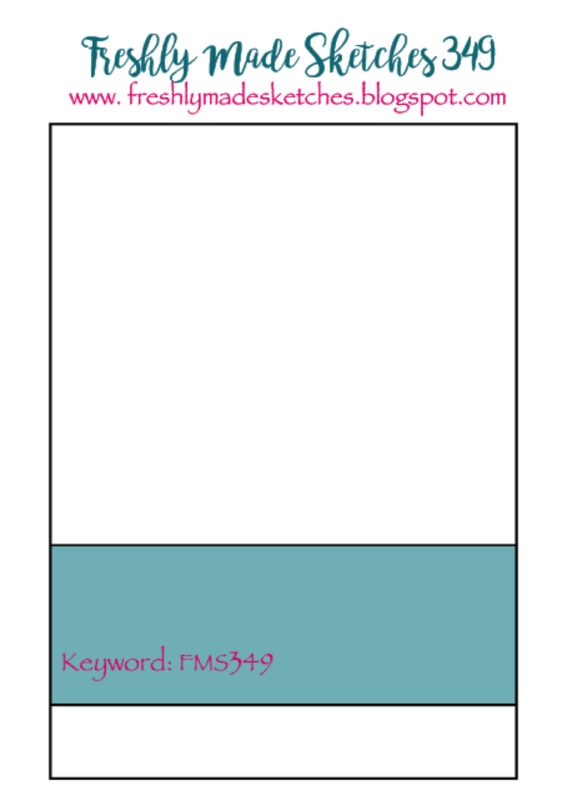 This card I’ve created is for the newest sketch at Freshly Made Sketches. Our fabulous sketch has been designed by my fellow downunderer (I totally made up that word….) Karren Johnson. Karren’s card are always creative, witty and just plain gorgeous! Karren’s sketch is perfect for adding layers or keeping it CAS. I’ve done a bit of both. I’ve kept a white background but added a couple of layers under my Graceful Garden roses. 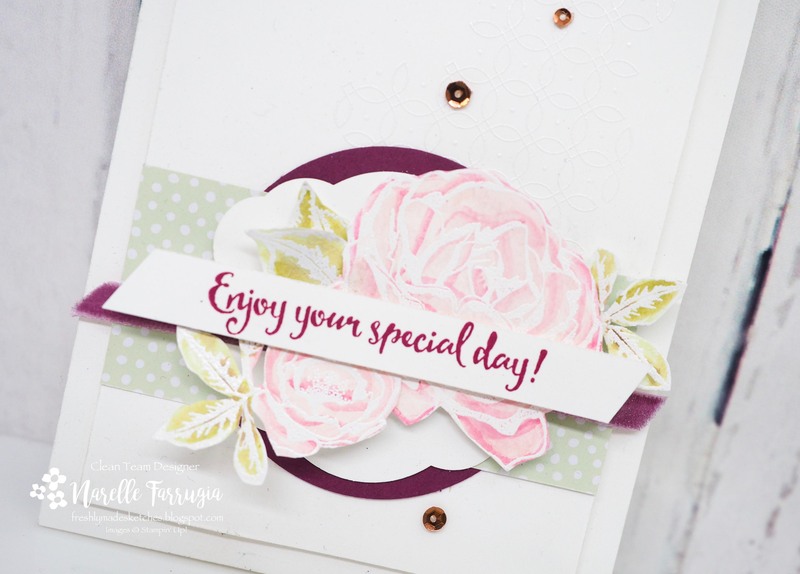 The roses are heat embossed with White Embossing Powder and very lightly watercoloured with Rich Razzleberry Ink. This technique is so easy to watercolour as the embossed lines are there to keep the watery ink from spreading. The leaves were also given the same light watercolouring treatment with Old Olive Ink. The sentiment I’ve used is from Dragonfly Dreams. I then added a strip of Rich Razzleberry Velvet Ribbon and some sequins. The Clean Team have created the most wonderful cards with this sketch. Head over to Freshly Made Sketches and take a look at their creations. Oh so pretty with those pink flowers and soft green! 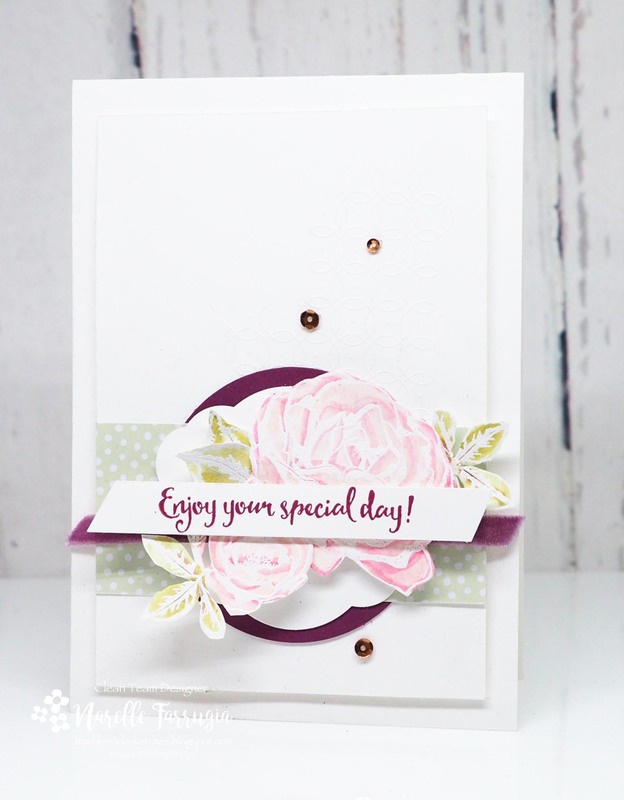 Oh this card is so beautiful Narelle! I love those flowers! They are so pretty! The sequins are the perfect accent as well! Oh and I love the word “downunderer”! I think it’s perfect!! !